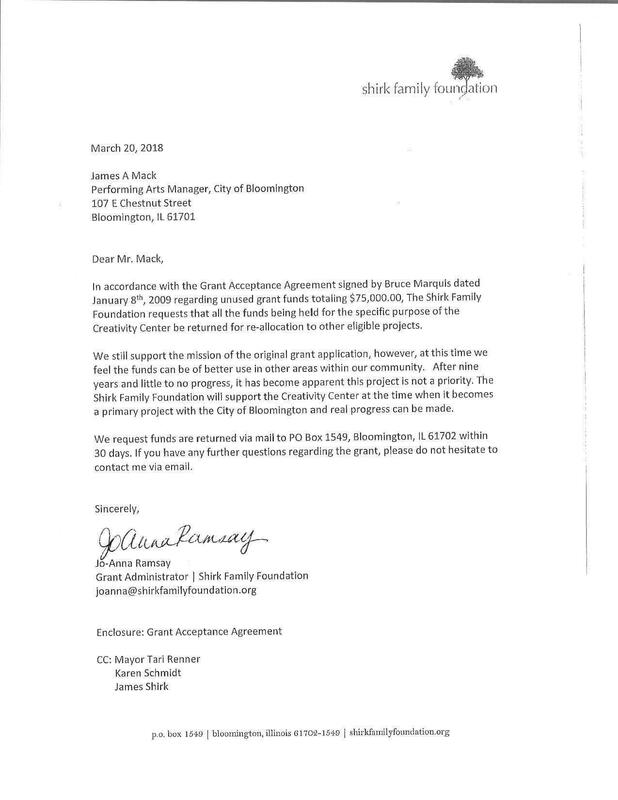 Why did Bloomington write a check to Shirk Foundation? The City stalled my FOIA, I finally received an answer late Friday. In 2009 the Shirk Foundation made a donation to the BCPA for the Creativity Center. Since nothing is happening there, except the City hired a fundraiser, the Foundation requested their money back. Posted in BloNo, Bloomington, BLOOMINGTON CITY COUNCIL, elections, Local, Renner, Taxes.Tagged BCPA, Creativity Center, Shirk Foundation. I hope that’s the end of a bad idea (aka Creativity Center). Bet Terri was mad! It didn’t take two weeks to get the FOIA by accident. Maybe MORE people will “pull” their grants, etc when they realize that government just DOES NOT care and relying on them to get things done is slower then a mars rover. I’d like to see HOW Tari would do in a REAL job! Not one where he can indoctrinate young minds and bully bloggers or cow toe to liberals. There is a lot of good the community could have done with $75,000 over the course of nine years. I wonder if the City ended up getting say $5,000 – $10,000 in interest for having the money parked in an account. Tari, the BCPA, and our “full-service” government bureaucrats can’t deliver again…what a shock! $75,000 handed to them on a silver platter with no voter backlash risk (because it was a private donation) and they did absolutely nothing. What a surprise! Does anyone think a non-profit organization gifted $75,000 would fail to meet the requirements and lose the donation? Ha! I agree that the whole thing is a blessing in disguise, as the Creativity Center would have turned into a multimillion-dollar boondoggle. Perhaps, the Shirk’s need the money since Green Top is about to fold like a cheap tent.